Indonesia’s current account deficit widened to USD $31.1 billion, equivalent to 2.98 percent of the country’s gross domestic product (GDP), in full-year 2018. It is a big deterioration compared to the USD $17.29 billion deficit (1.7 percent of GDP) in the preceding year. It means the current account balance remains the Achilles’ heel of the Indonesian economy, one that - potentially - triggers rapid and large capital outflows in times of global economic turmoil. Challenges for Indonesia’s current account deficit are not expected to ease in the first quarter of 2019. Yati Kurniati, Executive Director & Head of Statistics Department at Bank Indonesia, said the current account deficit will definitely continue into Q1-2019 amid Indonesia’s subdued export performance, subdued global economic growth, and declining commodity prices. These interrelated factors are crucial for Indonesia when determining whether the country will see a deficit or surplus, simply because Southeast Asia’s largest economy remains highly dependent on (raw) commodity exports in terms of its export performance. Despite these challenges, Bank Indonesia is optimistic that the current account deficit can improve to 2.5 percent of GDP by the end of 2019. The central government imposed several policies to encourage a healthier current account deficit, including a higher import tax on various consumer goods, the extended B20 biodiesel program, a renewed focus on development of the tourism sector, and fiscal incentives for exporters of natural resources to store their foreign exchange earnings in Indonesia. 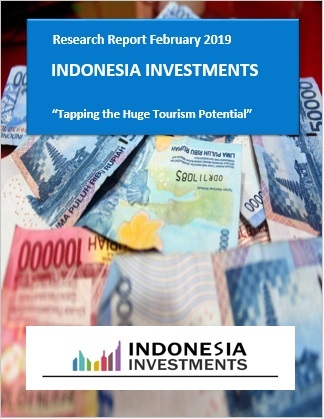 Kurniati believes the tourism sector could become key in overcoming the wide current account deficit at some point in the future because the potential of this sector is huge in Indonesia. This sector should be able to attract more direct investment and an increasing amount of foreign tourists (hence triggering rising foreign exchange earnings). Bank Indonesia therefore hopes that the government’s ‘Ten New Balis’ program (through which ten locations or destinations are prioritized to be developed into major tourist centers) will become a success. This program needs to be supported by infrastructure development as well as training and education programs for the local population so they can offer better services to tourists. Meanwhile, so far in 2019 capital inflows have been strong and therefore provide some relieve for the current account balance of Indonesia. Up to 7 February 2019, a total of IDR 49.6 trillion (approx. USD $3.5 billion) in capital has entered Indonesia in the form of government debt paper (IDR 32.4 trillion), shares traded on the Indonesia Stock Exchange (IDR 15.1 trillion) and Bank Indonesia certificates (IDR 2 trillion) on the back of investor confidence in Indonesia's financial and economic fundamentals, while external pressures (the Federal Reserve's recent dovish stance and a pause in US-China trade trouble) eased significantly since the end of 2018. • Indonesia's current account deficit in Q4-2018 and FY-2018; what causes the deficit? • How can Indonesia make its current account balance healthier? • Is having a current account deficit really bad? In what context can it be good?